The concept of Account Based Marketing (ABM) emerged in the early 2000s, but it has recently attracted marketers’ attention with its effectiveness. The growth in the decision-making, team’s size and misalignment of sales and marketing efforts have led to the need for an ABM strategy in B2B in organizations. Is Inbound marketing different from ABM? Yes, ABM turns the traditional inbound marketing funnel upside down. Instead of finalizing the company to target after filtering out all bad leads, you start with target companies. The focus in ABM is on that one or few accounts with the most significant opportunities, whereas in inbound the entire market is targeted. Technologies that support ABM are growing exponentially, helping organizations to scale their ABM strategy. But there is a big gap between companies implementing ABM and those successfully implementing it. Define Key Accounts –The first step is to build your target account list—the companies with the most potential to your business, which can include customers, prospects, partners or a mix of all three. 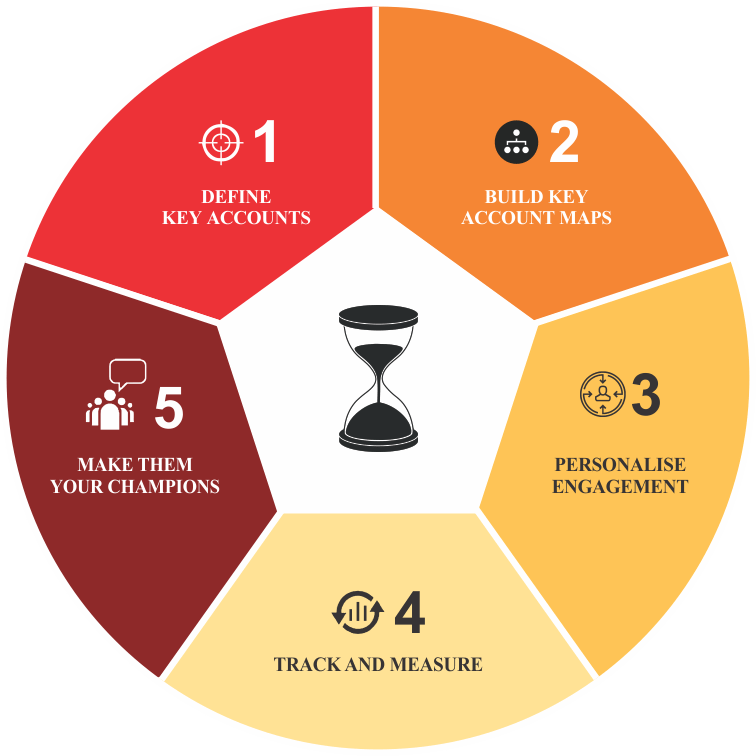 Build Key Account Maps – The next step should be to know key decision makers, influencers, and buying centers within the target account to create account maps and navigate through accounts. Personalise Engagement – Once the ideal account and its key decision makers are identified, it’s time to personalize their experience through engaging and targeted content. Track and Measure – You need an account-focused view of engagement, conversion rates and the ability to connect siloed datasets across the funnel. Make Them Your Champions – It is important to create a lasting relationship with your prospect/customers. Your customers can become your brand advocates/champions with the right ABM strategy. Why should you implement ABM? ABM’s goal is to get new customers and leverage opportunities to grow within the current accounts, in ABM Key Account’s are a market in itself. • Target Qualified Accounts – ABM helps to run programs that are specifically optimized for target accounts. It helps to avoid targeting many insignificant accounts with low conversion rates. By strategically targeting efforts, expenditure of resources can be minimized, and efforts are not wasted on less critical buyers or segments of the market. • Personalize marketing programs to increase conversion rates – Customers are more likely to engage with content that is created specifically for them and prefers offers which are personalized. ABM not only directs marketing and sales effort to the targeted audience, but it also personalizes communication to specific accounts. • Minimize Wastage of Resource – Since ABM is focused and targeted at the most qualified accounts, it minimizes the scope of wastage of resources. Marketers are more focused to use their resources efficiently to run marketing programs that are specifically optimized for target accounts. • Align Sales and Marketing teams – ABM is probably the best way to align sales and marketing teams. As with ABM strategy a marketer works with the same mindset of a salesperson – they think of how to generate revenue by driving engagement for accounts with high value and opportunity. • Greater focus on Customer Experience – ABM is not just about acquiring new accounts but also involves retaining and growing within that account through cross-sell and up-sell. With technology in place, a marketer can focus on building a relationship with the customer after sales to support different objectives.